Before Nyjer Morgan stepped to the plate in the bottom of the 1st inning for Our Washington Nationals and before Roy Oswalt threw his very first pitch in a uniform of The Philadelphia Phillies, Let's Go Phillies!! was heard throughout Nationals Park. One pitch later Morgan was standing on third base with a triple. Two pitches after that--Adam Kennedy knocked Nyjer home with an rbi ground out. Let's Go Phillies!! mostly silenced the rest of this evening. America's Worst Fans again invaded South Capitol Street, but on this night their theatrics were short-lived. In fact, they were shutdown, and their team nearly shutout. 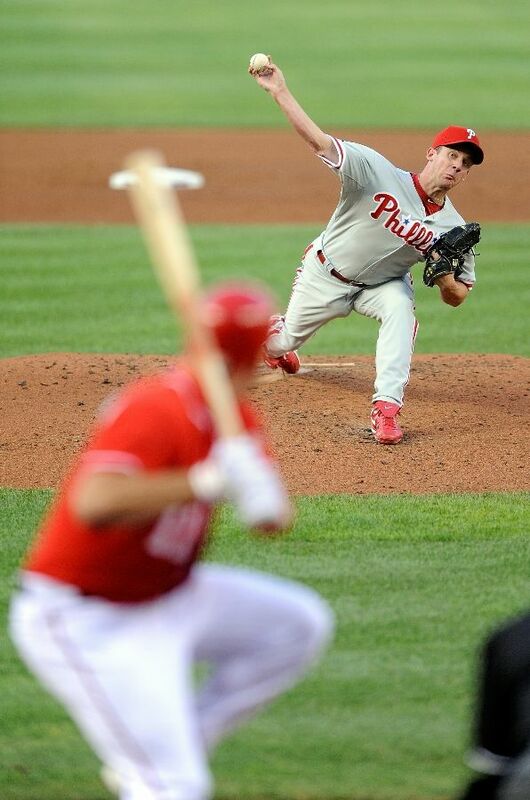 Philly fans mad their newly acquired ace pitcher, Oswalt, was anything but this evening. They became incensed after their catcher, Carlos Ruiz, fielded a routine bunt laid down by Adam Kennedy in the bottom of the 3rd with Craig Stammen on 2nd and Morgan on first, then watched in amazement as Ruiz threw the ball to third base to retire the lead runner. The only problem was that not a single Philadelphia infielder was manning the bag. A critical error that allowed Stammen to score easily for Washington's second run while setting up Our Number 1 to score moments later on a sacrifice fly stroked by Ryan Zimmmerman to right. An early 3-0 Washington advantage that left this Philly Fan sitting directly to The African Queen's right pissed. This young man so steamed, thankfully, he moved further away because things never really got better for The Philadelphia Phillies or their fans tonight. 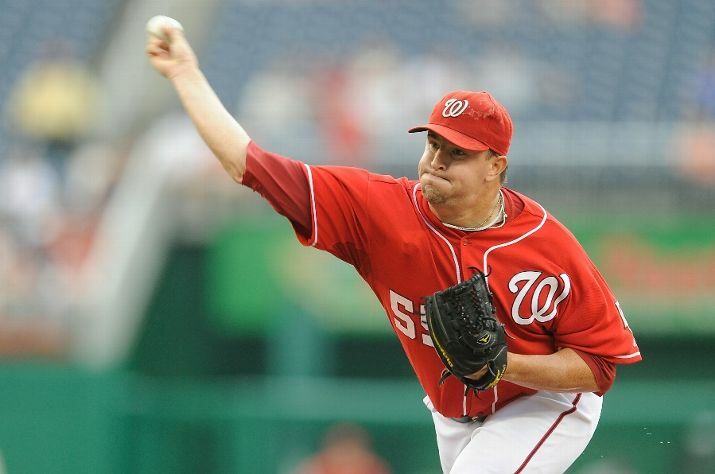 Craig Stammen pitched his most efficient game of the season while Roy Oswalt certainly didn't. Josh Willingham's double down the right line off Oswalt,acquired by Philadelphia from The Houston Astros on Thursday, sent both of Washington's Adams--Kennedy & Dunn--home for runs number four and five on the evening for D.C.'s team that began the slow streaming of Philly Fans getting up out of their seats and leaving Nationals Park. A march out to their cars and buses quickened once Our Washington Nationals struck for three mores runs, this time off Chad Durbin in the bottom of the 7th making the score 8-1, thanks to a bases loaded double down the right field line laced by Roger Bernadina scoring Kennedy & Zimmerman, and an Ian Desmond sacrifice fly scoring Willingham for the final tally of the evening. Mostly Washington fans on hand at the conclusion. A top of the 9th thrown by Collin Balester where "BallyStar" looked impressive throwing nothing but heat--95 & 96 MPH fastballs. And pretty confident too, against the reigning two-time National League Champions. Mettle shown all night long by D.C.'s Team in defeating The Philadelphia Phillies and their fans in game one of this three game series on South Capitol Street this weekend. Their fans didn't take over the park and their chanting of "Let's Go Phillies!!" was mostly silenced. Final Score from Nationals Park where the 32,590 in the announced crowd was probably split down the middle evenly as to who they were supporting: Our Washington Nationals 8 and The Philadelphia Phillies 1. Curly "W" Number 45 gave Washington their third victory in their last four days against a contender in The National League East. Again, D.C.'s Team played the better baseball against a supposedly finer team. And The Bang!! Zoom!! Of The Fireworks!! signaling the end to a beautiful night on South Capitol Street. Wonderfully cool summer temperatures were enjoyed along with strong starting pitching, good defense and timely hitting by Washington--all three facets of the game combining to silence the usual vocal throng of Philadelphia Phillie supporters. Craig Stammen lasted into the 7th inning and was only touched for one run. A solo shot off the bat of Jayson Werth shortly before he was removed by Our Manager Jim Riggleman. Stammen allowed five hits, walked one and struck out five. Until the 7th when he tired after reaching 80 pitches, Craig had thrown a pretty wonderful game and received a standing ovation from Washington's fans upon his exit from this game. Tyler Clippard again strong in relief of Stammen, shutting down The Phillies in the 7th when Craig got into trouble and pitching through the 8th with more shutout ball before handing the game over to Collin Balester for the final three outs. Oswalt wasn't helped by his defense but still got hit pretty hard. Not many cheap hits among the seven he gave up to Washington batters, but he still managed to throw six complete in the very first game in The Major Leagues he's ever pitched not wearing a uniform of The Houston Astros. Adam Kennedy played his finest game in a Nationals uniform. With Cristian Guzman now traded to Texas, Kennedy and Alberto Gonzalez will receive more playing time at second base. An opportunity Kennedy took advantage of this evening by going four for five at the plate, scoring two runs, knocking in one and stealing his 12th base of the season. Roger Bernadina also a major contributor, his double down the right field line in the bottom of the 7th was the frosting on the cake tonight, but his real baking skills shown in the top of the 3rd when Bernadina performed The Defensive Play Of This Game. With one out, Roy Oswalt laced a sharply hit baseball to right field between Adam Kennedy and Adam Dunn. Running in hard all the way to scoop up the baseball, Roger Bernadina didn't hesitate. He quickly transferred the baseball to his left throwing hand and immediately threw the ball right back into the infield, to 1st base, where Dunn caught the ball while standing on the bag--to retire Oswalt for out number two. A rare 9-3 putout that found Oswalt dropping his head in disgust, bringing moans from The Phillie Faithful and giving Washington's Fans the opportunity to give Roger Bernadina a standing ovation for The Defensive Play Of This Game. George won the 4th inning Presidents Race as Teddy, leading all the way, stopped to hand flowers to Miss Iowa. Katherine Connors getting some serious P.R. Mileage out of Miguel Batista's comments from earlier this week after his emergency start for Stephen Strasburg. Miss Iowa invited to throw out the first pitch tonight, meet Batista and have a good time at Nationals Park. The HDTV Scoreboard this evening put up the first picture of the Beer & Pitcher Set to be given out on August 13th when The Arizona Diamondbacks are in town. Continuing his tour of all 30 Major League Ballpark, Captain Morgan was on hand with his ladies to promote: Drink Responsibly, Captain's Orders. That guy was all over the place tonight. And finally, while leaving the park tonight, Sohna and I happen to exit alongside Danys Baez, Brad Lidge and a third Phillies Player. We struck up a conversation with Baez about Philadelphia's latest loss. And Baez comes up with this winning quote: "All games are important, but 10 minutes after it's over you have to forget about it, otherwise you will never be successful in this sport dwelling on the negative." P.S. 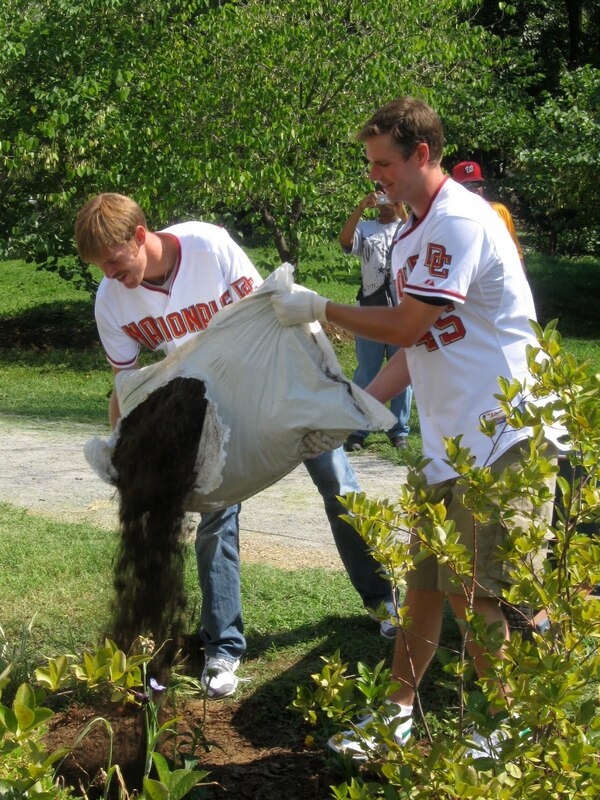 Friday July 30th was also The Washington Nationals Dream Foundation's NatsTown Green-Up Day in the SE/SW Community surrounding Nationals Park. Complete details and story to come, but here are a few pictures from the event where Nationals Staff were joined by nearly 100 volunteers and pitchers Collin Balester & Doug Slaten to clean up the neighborhood. 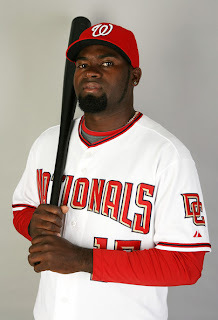 Confirmed tonight by Nats320, Cuban defector Yuniesky Maya--rumored to be close to coming to D.C. two weeks ago, has officially been signed to a contract by Our Washington Nationals. Tomorrow, July 31st, 2010--Maya will be introduced to the media. Sources telling Nats320 that Maya will be on the fast track to the major leagues and slotted as Washington's Number Three Starter. 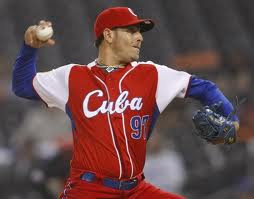 A member of the 2006 and 2009 World Baseball Classic Teams for his native Cuba, Maya finished his 2008-2009 Cuban National Series Season as Cuba's second best pitcher. Only topped by Aroldis Chapman--now a member of The Cincinnati Reds. Complete information about Maya can be found at this link to Baseball-Reference.com. Last year when Cristian Guzman was having bunion issues and couldn't run well at all, Our Washington Nationals had to sit Guzzie down for a spell because he always insisted he could play and contribute to his team. Sohna and I ended up talking with Radio Broadcaster Charlie Slowes about exactly that a little bit later in 2009. How badly "The Guz" wants to play every day? "If Cristian Guzman got into a car accident coming to the ballpark and broke an arm or a leg, he would still show up and insist that he could play that day. That's the way he is. He never complains about anything." We've never forgotten that comment and it truly does show that Cristian Guzman is a professional. Tanner Roark and Ryan Tatusko the reported two pitching prospects received from Texas. Roark as some decent pitching numbers. Tatusko, if anything, is a late bloomer. He's 25 years old. Roark is 23. But neither are top prospects. Not only is it impressive that Our General Manager Mike Rizzo convinced Cristian Guzman to agree to a trade today to The Texas Rangers, (Guzman didn't have to having played for at least 10 years in the majors including five straight with the same team) but also smart on Guzzie's part to take the bait. With his contract coming to an end, playing for a last place team and receiving less and less playing time in D.C.--Guzman is now thrust right back into the spotlight of an American League Pennant race--where he will start until Ian Kinsler returns from the Disabled List for Texas. And will be given every opportunity to impress every other team in the game for a potential 2011 and beyond contract. Guzman is now in a no lose situation--just like Mike Rizzo is in turning this trade for reportedly two Texas pitching prospects. 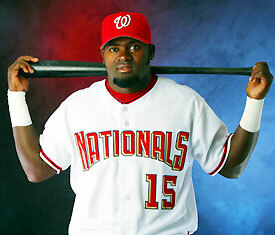 Both Cristian Guzman (the longest tenured player in Nats History) and Our Washington Nationals are better positioned by this trade. A win for the traded veteran and a win for his former team. And you have to give Guzman credit here. He's been nothing but a team player throughout his career in D.C. He's never complained, not even after Washington moved Ian Desmond into his starting shortstop position this year. Guzzie hustled each and every time he was put in the lineup. He earned our respect and our appreciation for all of that. And was a true professional to the very end--even in accepting the very trade, he didn't have to--which sent him away from his full time, year round, home over the past six years--Washington D.C.
We don't know a single thing about catching prospect Wilson Ramos or pitcher Joe Testa, widely reported to be acquired tonight from The Minnesota Twins by Our Washington Nationals for Matt Capps. And we are not going to pretend to either. But The African Queen and I do know that Matt Capps is a decent person and we enjoyed watching him perform on the mound wearing The Curly "W". Thrown off the cliff by The Pittsburgh Pirates last winter, Capps enjoyed a renaissance season closing games in The Nation's Capital. He solidified the back end of Washington's bullpen, made the National League All-Star team and showed up for countless community events. From the very first moment Sohna and I first meet Matt Capps, we knew he was a class act. As we've stated many times before, the hardest part of being a fan of Our Washington Nationals is watching the good people, the one's we know are quality human beings, sent packing to another team. The business side of the game is many times hard to swallow. 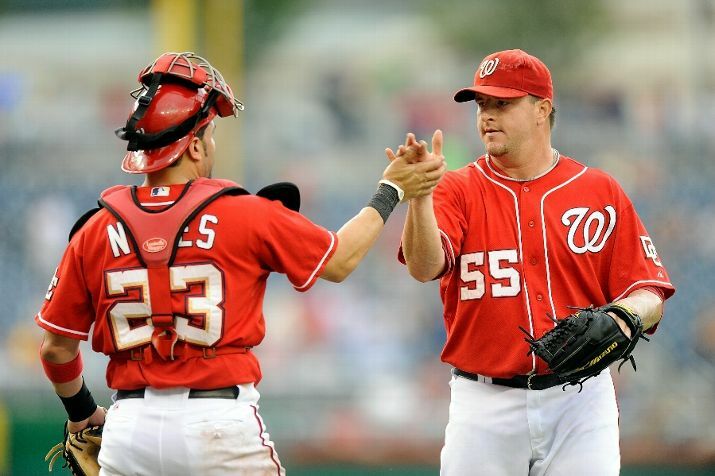 We enjoyed Matt Capps wearing a Washington Nationals uniform and only wish him the very best in Minnesota or wherever his Major League career eventually continues after 2010. And you can bet, if The Twins make the playoffs this season, Nats320 is rooting for Minnesota in The American League post-season. Good Luck Matt, Sohna and I only wish the best for you and Jennifer. Takahasi Saito just kept staring. He couldn't keep his eyes off the spot where the baseball he had just thrown moments ago had landed. Adam Dunn had just put the exclamation point down on Our Washington Nationals latest Curly "W". An opposite field jacked shot into the Red Porch seats in left center. A solo home run in the bottom of the 8th that landed in the waiter service section of Nationals Park's Stadium Restaurant. Saito look absolutely stunned, just like his Atlanta Braves teammates must have felt after the conclusion of this three game series on South Capitol Street. 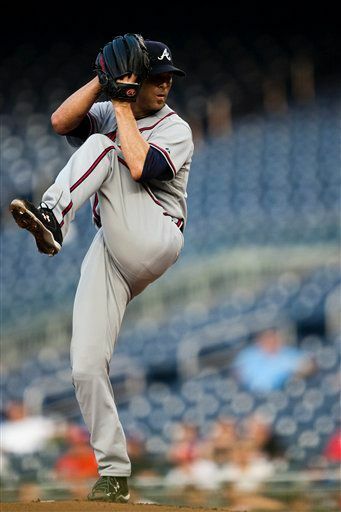 The First Place In The National League East Tomahawk Choppers had avoided facing Stephen Strasburg. They had beaten Livan Hernandez but lost to both Miguel Batista and Scott Olsen. Go figure? Returning to Major League service this afternoon after missing the past two months due to shoulder inflammation in the pitching arm (sound familar? 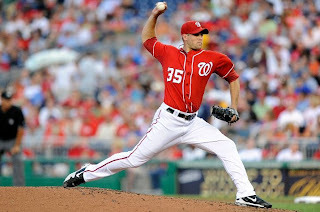 ), Scott Olsen re-enforced his desire to become a constant part of Our Washington Nationals starting rotation, not an unstable part. Atlanta's Matt Diaz took him deep for a two run homer in the top of the 4th. The one truly bad pitch offered up that didn't alter the effect, or the excitement, of this still young southpaw trying to resurrect the same promise shown a few years back while a Florida Marlin. This afternoon D.C.'s team put on display it's capability when their youth plays smart baseball and their veterans supply the always needed support. Perhaps no one gave their all more than Ian Desmond. Washington's rookie shortstop recorded his 24th error on the season, but not before he provided much of the fire power before Dunn's shot. Desmond with one wicked solo home run stroked to right center off Derek Lowe that easily cleared the Out-Of-Town Scoreboard. And followed that blast up with a double and second run scored of the day when Wil Nieves--Yes, Wil Nieves--singled to right center in the bottom of the 4th plating Michael Morse as well. Nieves two RBI's putting Scott Olsen back into the lead, an advantage he never relinquished during Our Number 19's six complete innings on the mound. 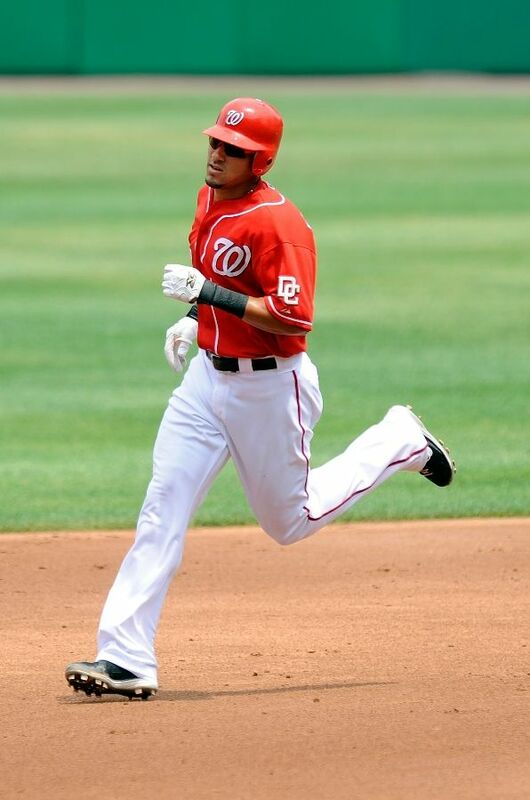 Ian Desmond played some sharp defense this afternoon at Nationals Park. He got handcuffed in the top of the 6th on a backhand attempted rocket shot one hopper to his right. 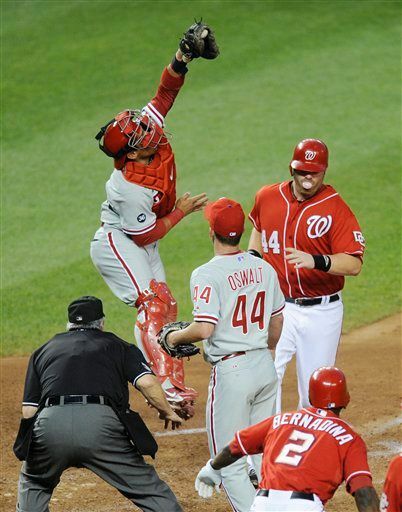 But before and after that miscue, Desmond cleanly worked his way through a series of fine defensive efforts. Nothing that makes the highlight reel, but the stuff that makes a manager's head nod in appreciation. Ian Desmond put on a show today. The very athletic and skillful abilities that has any team wondering just how good he can be? Just like Washington's Bullpen. Again this afternoon, three scoreless innings pitched from Sean Burnett, Drew Storen and Matt Capps. All three performing needed duty after a 1:32 rain delay that forced both Olsen and Derek Lowe from this game. A strong point most all season, Our Manager Jim Riggleman seems to have finally found a winning combination out of his pen. One that is flexible and capable of pitching in just about any inning--whether the need comes in the 5th, 6th, 7th, 8th or 9th. Burnett, Storen, Tyler Clippard, Joel Peralta and Doug Slaten are interchangeable parts--Miguel Batista the wild card. Only Capps the constant--remaining in his closer role. A job he's relished all year wearing The Curly "W". Today, Our Number 55 recording his 26th save of 2010. And remember, Adam Dunn will always be known for the long ball. His 24th home run of 2010 off Saito visually proved how powerful the left handed slugger truly can be. 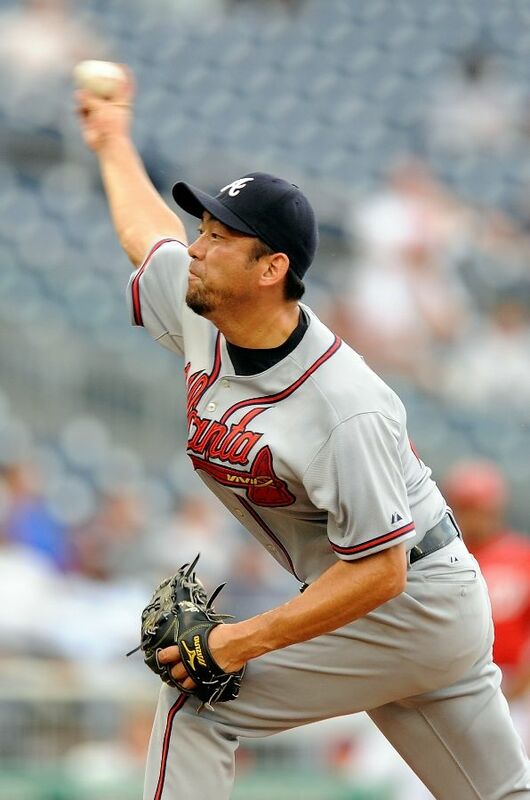 Atlanta's Japanese Import threw a 90 MPH fastball over the outside corner of the plate. Not thrown necessarily low, Our Number 44 didn't golf the baseball either. Instead, Adam Dunn muscled that pitch out of the park. That's why Takahasi Saito was stunned. And that's why his Atlanta Braves Teammates are taking a flight to Cincinnati this evening bewildered. 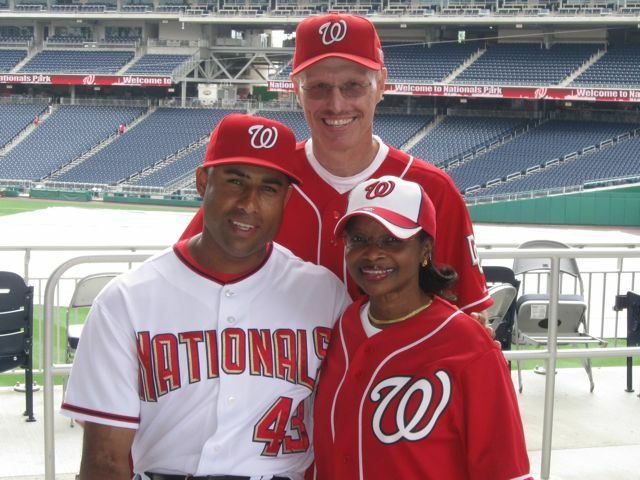 D.C.'s team engaged The Braves this week. They contested Atlanta with some smart baseball every step of the way. Their youth stepped up and their veterans didn't back down. The result? A last place team beating a first place team two times over the past three days. Final Score from Nationals Park where not even a hard rain and subsequent long delay could damper the spirits of an all-around good ball game: Our Washington Nationals 5 and The Atlanta Braves 3. Curly "W" number 44 of 2010 dumbfounded The Tomahawk Choppers. With one of the best offenses in the National League in the park wearing visiting uniforms, Atlanta couldn't figure Scott Olsen and Washington's Bullpen out. Much the same experience witnessed two nights ago when Miguel Batista made his emergency start. The Bang!! Zoom!! Of The Fireworks!! proving exactly what Batista mentioned to Nats320 yesterday. If you play smart baseball, it's not going to take much more to win. The Atlanta Braves were stunned by Our Washington Nationals this afternoon, as well as, this past Tuesday night, because Our Manager Jim Riggleman's constant re-emphasis to each and every one of his players on his roster to play the game astutely--seems to have finally taken hold. There was some good baseball played by both sides during this just completed series with the final results stunning to some. The better prepared team had won. And that was Our Washington Nationals. As for that stunned look on Takahasi Saito's face? It will not be forgotten anytime soon. Scott Olsen's Numbers--six complete innings pitched, five hits and two walks allowed, just one strike out and three runs--two of which were earned. I don't think any of his pitches reached above 92 mph, but Olsen used his fastball to set up his changeup. And that became his out pitch most of the time he was on the mound. Better than anyone probably expected, Scott Olsen received his third personal win of 2010 against two losses. 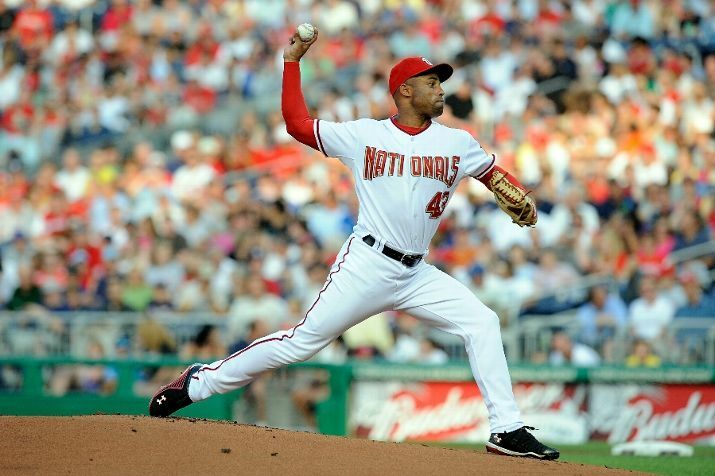 And at least for one day, helped stabilize a listing Washington rotation in need of quality starts. Washington's bullpen again lights out. At a time when Strasburg has gone down and placed on the Disabled List, Livo has his shortest stint of the season and Ross Detwiler and Craig Stammen continue to struggle--Jim Riggleman's bullpen again has been game worthy--keeping things close, holding leads and giving Our Washington Nationals something to play for, late, in most every game. Washington's bullpen throwing 11.2 shutout innings over the last three games. In his past 12 games played, Michael Morse at the plate is 14-for-29 (.483) with 2 doubles, one triple, 3 home runs, and 12 RBI. Today, he finished this game 1-for-3 with an RBI and run scored. Morse has yet to find a true position on this team, but he continues to sock the cover off the baseball. Desmond's homer was his 7th of the season and his 43rd RBI. For the earliest home start of the season--12:30PM--30,262 the attendance for this Businessman's Special. Not bad. And finally, late this afternoon, Our Washington Nationals announced that Miss Katherine Connors--Miss Iowa--will throw out the first pitch Friday Night at Nationals Park when The Philadelphia Phillies come to town. Miguel Batista will catch that ceremonial toss and continue to give Miss Iowa more free nationwide publicity than she could EVER have expected. This all coming in response to Batista's now famous comment to the media after his emergency starting appearance for Stephen Strasburg on Tuesday night comparing coming to see Miss Universe and being left watching Miss Iowa. Miguel Batista is a board member of The Major League Baseball Players Association--the Players' Union. 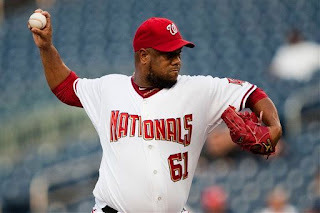 Our Washington Nationals pitcher has closely watched the brewing controversy over the new immigration law statues that Arizona is trying to implement within their state borders. The uncertainty over how the laws would be carried out has concerned professional sports teams nationwide. And The Players' Union has been closely watching the proceedings. Yesterday, a federal judge blocked the most contested portions of Arizona's new immigration law one day before it was to take affect--including a provision that required all immigrants to carry their papers with them at all times. Our Washington Nationals would have been the first professional team to visit Arizona had the law become official. Nats320: Are you comfortable talking about the Arizona Immigration Law and how it might affect professional baseball players? Batista: Yes, I have been talking about it for a while now. Nats320: Good, because today a federal judge issued a temporary restraining order for the most controversial aspects of the law. Batista: Yeah, that’s what I heard. Nats320: So we are curious as to what your response is to that? Batista: I got a text from the union saying it was knocked down by the judge and it would not be implemented. And I believe that is going to be good for a lot of people. Personally, I believe the decision (in Arizona) that was suppose to solve an immigration problem was taken in the wrong direction. I think there are better ways to do it. That law would hurt that state more than anything. Look, financially, how much income would have stopped coming to Arizona? As a tourist, you don’t want to go to a place where you are going to be harassed. One of my points was that nobody had ever come out and specified what makes a person suspicious? What gives the police officer the right to ask you for your papers? Why? Is it because I have an accent? Or because I don’t have blonde hair or blue eyes? What actually stereotypes a person to make them submitted to that law? And I believe that would be a very big controversial issue? So I am glad it is out of the way for a while. Nats320: As a union, was there anything you were trying to do--working with Major League Baseball--to bring your issues forward? Batista: Well this issue was brought to the table and we talked about it on the board (MLBPA), but it’s a thing that people need to understand it’s a political issue.It’s a state issue and has nothing to do particularly with baseball. We actually advise our members that it’s a personal decision. As a union, we will respect your decision and back you up, but only until it actually doesn’t affect our members directly. We have to wait and see how things turn out. And we were hoping after the snowball kept rolling, the issue would get big enough for people to try to stop it and we would not have to jump in. We believe, in a lot of ways, that we would be hurt. But not only would Major League Baseball be hurt, but every sport and every team. Look at Arizona, they have them all--from soccer to football to baseball, basketball and hockey. And when you look at the rosters of all the sport teams, 60 percent of the players are all foreigners. Nats320: Was it then a concern on a personal basis that if they go to Arizona to play, they would have to carry their documents? Batista: A lot of the guys were very uncomfortable with the idea. And the issue was raised because the All-Star game is scheduled to be played there next year--which would have brought a lot of factors. First of all, the All-Star game is a different story. If you get chosen for the All-Star game and you tell the commissioner you don’t want to go: ‘I don’t believe I want to be harassed.’ He can’t tell you: ‘No, go.’ But when you have a contract when your team is going to play in Arizona and you tell your team you don’t want to go, then that becomes a labor issue. You are violating your contract because you are not going to work as required, but you have a legitimate, and I believe this is actually what we are talking about, we have a problem that you are backed up by the (U.S.) Constitution. People are arguing on your behalf, and you believe, they are violating your constitutional rights. So that is going to be a big mess. Hopefully, we will never get to that point, but it’s important that people respect that. Nats320: This issue is probably going to end up in The United States Supreme Court. But is it not the team’s responsibility to protect you if they are going to take you to that state to work? Batista: Yeah, but protecting you has different standards. You can’t just have a guy that is walking with you with your papers signed right behind you (chucking) saying: ‘Yeah, I do have my green card!’ That would be a very controversial issue because, like I said before, the (Arizona) law doesn’t specify what type of people fall into that category. And what makes a person suspicious? If it’s fully up to the police officers discretion, then a lot of police officers are going to be accused of stereotyping, abuse of power and things like that. So I believe this is a very sensitive subject, especially for a lot of latino players in The Big Leagues that don’t speak english very well. And when you see them walking in groups, you never hear them speaking anything but spanish. We have some of our biggest superstars who don’t know more than three words in english. So this would be a very controversial thing for us. Nats320: As a member of The Washington Nationals, if this law did not get knocked down today, your team would have been the first professional team to visit Arizona under the new law. Had you talked to other players on the team about it? And what might happen? Batista: No, not really. Some of the guys have expressed their feelings about it, but we haven’t had a meeting as a team for it because regardless of the fact that we are The Nationals, we are a part of the MLB Player’s Association. So we have to do everything as a union. And in being the first one’s going there, I believe our President (of the MLBPA) is going to be there by the time we are there and that would be a big help. If something were to happen, then we would have our biggest eyewitness there to bring the matter to congress and tell how ugly this could turn. Nats320: President Obama is also against the implementation of this law. Nats320: But there are some who would want to do that. Batista: But it’s an issue that I am glad is being looked at and if it ends up in the Supreme Court then that is what this country is all about. Men and women have rights as an employee, as an employer, as a state, and as a citizen. Things are going to be brought to court in trying to find the best way to find a solution to the problem--to the benefit of all the people. 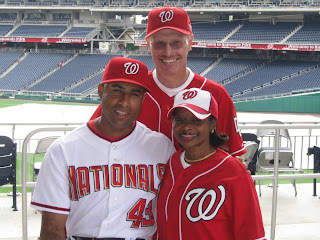 Last night, before Our Washington Nationals took on The Atlanta Braves in game two of a three game set at Nationals Park, Sohna and I talked with Miguel Batista. We set up this interview on a completely different subject well in advance of his emergency start for Stephen Strasburg on Tuesday. But after Batista filled in admirably for Strasburg and stated his now famous quote about Miss Iowa, Nats320 gathered Batista's thoughts on getting booed on the very night where he proved the The Show Must Go On. Nats320: What was it like to be told 10 minutes before the game you are pitching? How did the team approach you? Batista: Well, I was actually at the Chapel Room and they (the team) came before The National Anthem. "Hey, they want you in the pen! They want you to start the game." "Yeah right," I replied. Then I came out and here’s Riggleman--‘"Hey, you got to start this game because Strasburg has a sore arm." I couldn’t believe it. So I put my shoes on and started running to the pen. Five minutes later, I am in the game. That tends to happen in this game and you have to be ready for it, especially guys like me that can pitch on long rest and no rest. 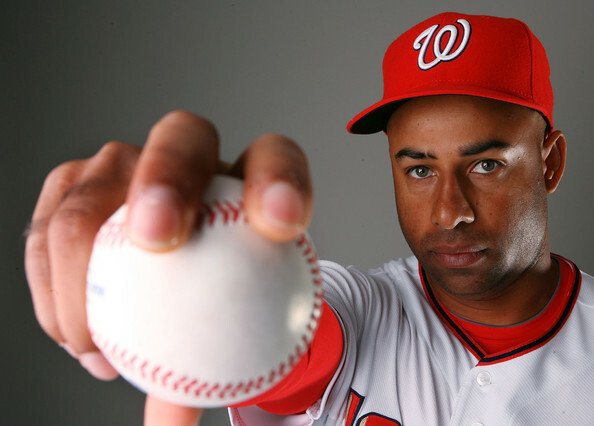 Nats320: Did you expect to get booed? Batista: No, but it was like I was telling people, they (the reporters) actually took my quote wrong. When I said that people pay to go see Miss Universe and they end up hearing that it’s Miss Iowa--you just define the person by the name of the town. But when you actually look at Miss Iowa, her name is Katherine Connors, you go--hold, hold, hold on!! This is a beautiful lady. I don’t know where you came from, you may come from Iowa, but she’s gorgeous!! And that is what I was actually trying to say. How can they boo me when I haven’t even thrown a pitch? Why don’t you watch me perform and then you make your judgement? I tried to do the best that I could. I didn’t do the Strasburg 10 strikeouts. But as a team if you noticed, from the first inning, Nyjer was running. The guys were putting the ball into play. We didn’t hit the homers as we do, but we played smart baseball. We are a winning team when we play smart baseball. That’s one thing that Riggleman has been trying to make the guys understand. You have to play smart. You can have the speed and agility of the youth, but you have to play smart because if you can play smart it’s not going to take much more to win. Coming later today, an in-depth interview with Miguel Batista on a completely different subject. Since baseball returned to this nation's capital, few pitchers have dominated Our Washington Nationals quite like Tim Hudson. He's most always been outstanding and tonight was no different at Nationals Park. If not for The Atlanta Braves starter walking Ryan Zimmerman with two outs in the bottom of the 8th with Adam Dunn stepping to the plate in a two-run game, Hudson might well have gone the distance on this most humid and most uncomfortable of outdoor evenings. Atlanta's Number One Starter finishing off 23 Washington Batters this evening before being relieved by The Braves Closer-In-Waiting, Jonny Venters, with one out in the bottom of the 8th. Before that moment came though, Hudson struck out seven and induced 12 ground ball outs (including one double play). Just three D.C. batters recorded an out via a fly ball. And those that did hit the ball in the air mostly stroked some weak ones. 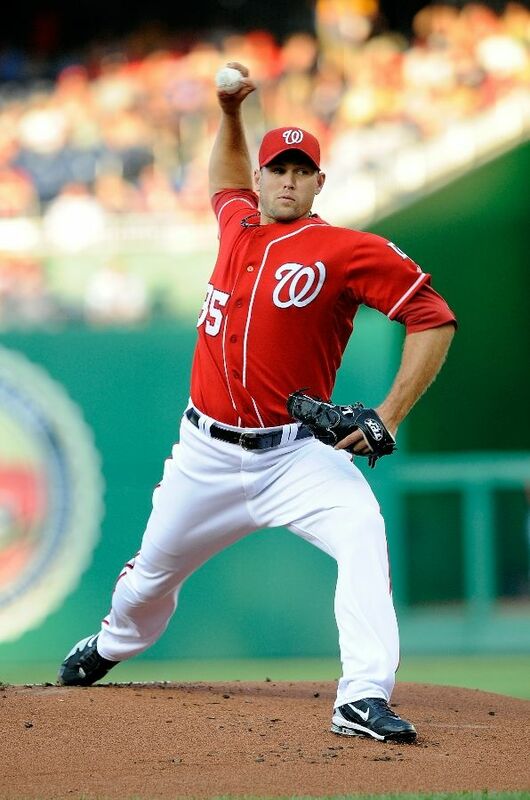 Tim Hudson had his fabulous sinker working this evening on South Capitol Street. Only Pudge Rodriguez was able to get to Hudson when Tim threw one bad pitch up in the zone in the bottom of the 5th. A fastball laced to center for a double. The only run plated this night by Washington scoring moments later when Michael Morse hit a looping liner to right--just over the head of Atlanta's 2nd Baseman Martin Prado--scoring Rodriguez. Tim Hudson wasn't hit hard and was most always in total control all night long. And only after reaching 96 pitches and being in lead 3-1 with Our Number 44 stepping to plate with The Z-Man on 1st in the bottom of the 8th--did Hudson ever seem vulnerable. 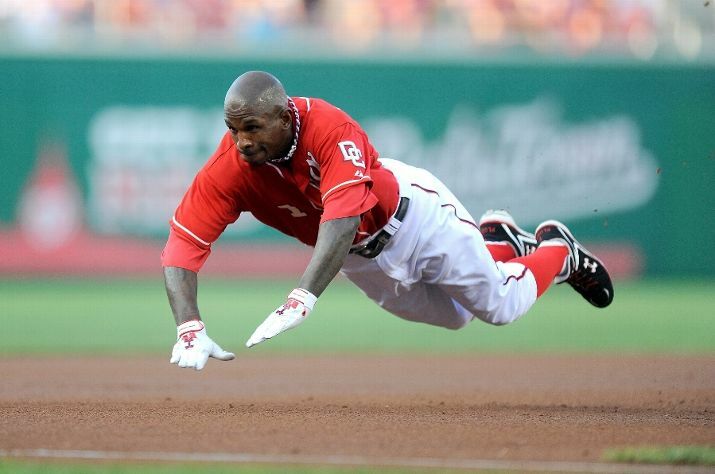 But really, The Atlanta Braves had little to worry about this night at Nationals Park. Their manager, Bobby Cox, wasn't going to allow Tim Hudson to pitch so well and then find himself in a position to possibly lose this game. Calling on his strong Lefty-Lefty Duo of Venters and Billy Wagner out of his bullpen, The Braves silenced any further thoughts of a Washington comeback. Venters striking out Dunn to end the 8th and Wagner recording a 1-2-3 ninth to complete this game. 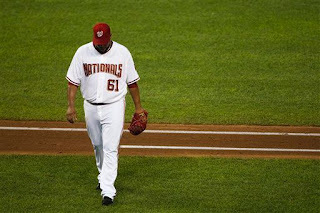 Now Livan Hernandez wasn't awful starting for Washington, but he didn't have much in the tank either. Ole Number 61 struggled through the first frame, giving up two runs and eventually three, before tiring noticeably in the middle of the 5th inning. But Livo's effort mostly didn't matter at this point because Our Washington Nationals couldn't solve Tim Hudson's magnificent start when coupled with Venters' and Wagner's finish. Final Score from oppressively humid Nationals Park where the air was so thick you could truly cut it with a knife: The Atlanta Braves 3 and Our Washington Nationals 1. Atlanta's Tim Hudson continued his mastery over D.C.'s Team, recording his 11th personal win of 2010 and his 10th career victory over Washington in 11 decisions since 2005. 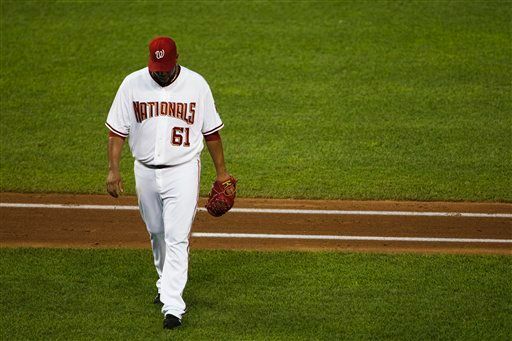 Loss Number 58 of 2010 for Washington came at the hands of one of baseball's best pitchers. Tim Hudson can dominate with his command and control. His economy of pitches was phenomenal. Working fast, Hudson had the upper hand and nothing, not a game time temperature of 90 degrees or any batter from Our Washington Nationals faced was truly going to beat him. 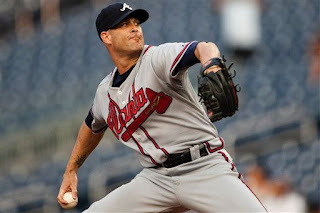 Tim Hudson called most all the shots this night and his Atlanta Braves teammates scored just enough runs to take him to victory. Really, there is not much more to say about this one because Tim Hudson was simply OUTSTANDING. Livan Hernandez was roughed up in the first inning when Martin Prado led off this game with a single to center and Jason Heyward followed with a double down the right field line. Chipper Jones got Prado home on a sacrifice fly to center. Brian McCann then walked and Atlanta scored their 2nd run on a Livo strikeout of Eric Hinske as The Braves attempted a delayed double steal on that 3rd strike to Hinske. McCann took off from first on the pitch. Pudge Rodriguez threw through to second base to Ian Desmond covering. When McCann stopped and dashed back toward first base, Desmond threw to Adam Dunn. A this point Heyward took off from 3rd base toward home plate. With Adam Kennedy sneaking in behind McCann between 1st and 2nd base, Dunn turned and threw home too late to get Heyward scoring Atlanta's 2nd run. If only Dunn had thrown the baseball to Kennedy, he would have easily tagged out McCann before Jason Heyward crossed home plate and scored. 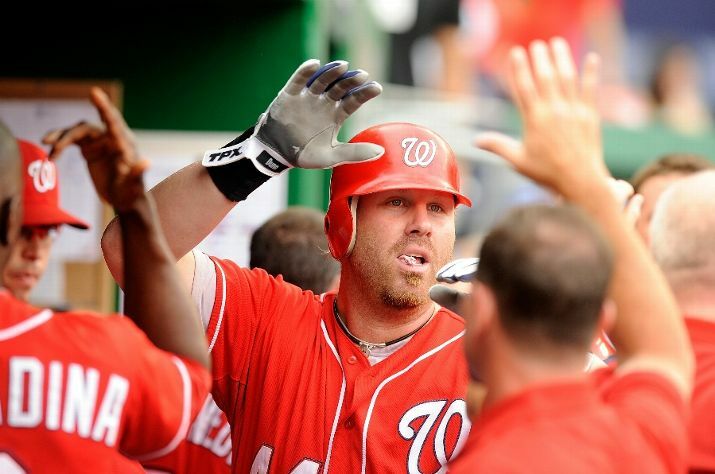 A mental mistake by Adam Dunn that cost Washington a run. Martin Prado doubled off Livan leading off the top of the 5th and scored The Braves 3rd and final run this evening two batters later when Chipper Jones knocked Prado home for the second time this evening on a single sliced to left field. Ole Number 61 being relieved at this point by Doug Slaten. Now we don't the official tally, but we would bet Martin Prado has hit more doubles against Our Washington Nationals than any batter faced in the past six years. Few games between these two teams go by without Atlanta's All-Star 2nd Baseman lacing a two-bagger against us. Slaten pitched to one batter in the 5th, Tyler Clippard looked more like his old self from earlier this season when he struck out three Braves over 1.1 innings pitched. Joel Peralta finished off this game for Washington by tossing three shutout frames. You can't say much more about Tim Hudson's effort tonight. He was the ballgame, simple as that. Billy Wagner recorded his 23rd save of 2010 in the 9th for Atlanta. George won the 4th inning Presidents Race easily, then was joined by his Rushmore friends to dance some sort of jig together after the finish. And finally, NatsTV started using this high level camera placed on the terrace level of the 3rd base side at Nationals Park. The angle allowed for some nifty shots of Washington's 1st base dugout and pitchers warming up on the mound and hitters getting loose in the on-deck circles. Nice. If Our Washington Nationals want to honor Andre Dawson on August 12th at Nationals Park for his recent induction into The National Baseball Hall of Fame & Museum, fine. But we don't want to see his Montreal Expos Jersey Number 10 retired forever on South Capitol Street. And that holds true for Gary Carter's Number 8 and Tim Raines' Number 30. Andre Dawson never played a single regular season game in Washington, D.C. He last played for The Expos 19 years before Major League Baseball relocated the franchise to Washington. D.C. The first eleven years of Andre's Big League career took place in a home stadium north of the American border. As great as he was, Dawson clearly has no ties to The District of Columbia. And in fact, during his Hall Of Fame Induction speech last Sunday, Andre went out of his way to glance over the very city, the very team and very franchise that drafted him, developed him, and gave him every opportunity to start his wonderful Big League Career. That's Montreal, in Quebec, in the country of Canada. With a hundred or so diehard to this day Expos Fans on hand in Cooperstown, New York to possibly witness the very last player in Montreal's 36 year Major League history to be enshrined in The Hall Of Fame, Andre Dawson profusely thanked the city of Chicago, The Cubs organization, their fans and Wrigley Field for his six years playing on The North Side. Some of his family members wore Chicago Cubs attire too. No one glorified The Expos. Dawson individually thanked former Montreal teammates Gary Carter, Tim Raines, Ellis Valentine and Warren Cromartie in his speech, but he didn't single out the city and franchise that gave him his stardom in the game--or their fans either--Montreal. Dawson lumped his final four years of Major League baseball playing for The Florida Marlins and The Boston Red Sox as being just as important as his nearly one dozen years in an Expos uniform. That's telling, especially after Andre Dawson fought The Baseball Hall Of Fame and Museum over being inducted into Cooperstown as a Montreal Expo--only the second player to be so honored (Gary Carter the first). On August 12th, Our Washington Nationals are going to show respect to Andre Dawson for a great Major League Career and the ultimate honor in baseball, and that's fine. 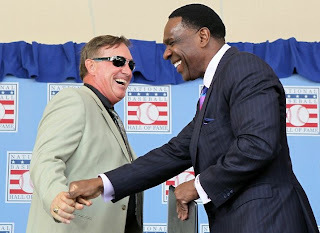 But please, don't retire his jersey number and hang it from the rafters at Nationals Park because at possibly his greatest moment in the game, being immortalized into Cooperstown, Andre Dawson showed little respect for the franchise (The Expos) and the city (Montreal) which launched his Hall Of Fame career. Years ago, Andre Dawson cut ties with the Montreal/Washington Franchise and he's never looked back at that decision--even after being inducted into The Baseball Hall Of Fame & Museum. P.S. 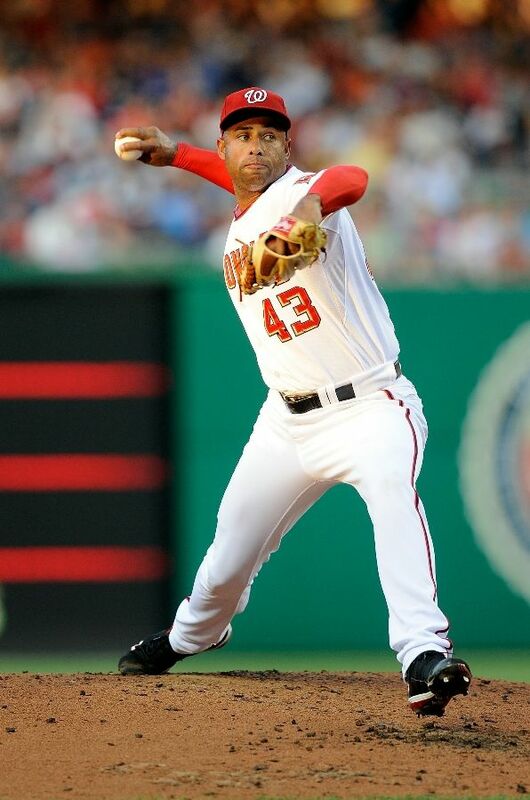 The Minnesota Twins have never retired a single jersey number of an Original Washington Senators player. They don't even recognize Walter Johnson on their mlb.com Hall Of Fame players list. The Texas Rangers have worn Expansion Senators retro jerseys in the past, but they've never honored Frank Howard. The Baltimore Orioles don't usually recognize The St. Louis Browns, but they fully acknowledge that Hall of Famer John McGraw was their manager in 1901 and 1902. The very team that is now The New York Yankees. The history should remain with the city in which it was made--not in some far away land where the fans have little or no recollection of the facts. That's why there are groups like The Philadelphia Athletics Historical Society and The Baseball Hall Of Fame & Museum--so the past will never be forgotten. The feeling was similar to heading out to a sold out Broadway play. The sure to be Tony Award winner with the hot lead actor everyone wants to see. But when the curtain rises for the start of Act One--the understudy is standing on stage. The back up bit player that doesn't have the pizazz of the star. The entertainer everyone came to see that evening had called in ill. But as everyone knows--the show must go on. That's exactly what happened tonight when Miguel Batista's name was announced as the starting pitcher for Our Washington Nationals. Shocked looks, many stunned faces, and boos were heard throughout Nationals Park before the very first out was recorded against The Atlanta Braves. But after the fill-in's performance results were near equal to the star--a standing ovation was seen after the 27th and final out was recorded. Miguel Batista receiving the curtain call as The Player Of The Game. 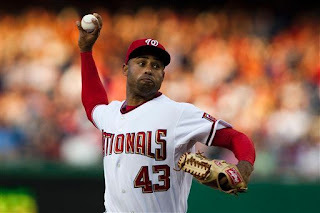 Rushed into service as an emergency replacement for Stephen Strasburg moments before the beginning of tonight's affair, Batista pitched his finest game of the season in a Nats Uniform. The man wearing Number 43 mesmerized The Braves for five strong innings. He struck out six, walked one, allowed just three hits and gave up--most importantly--not a single run. So did the three Washington relievers that followed him. Sean Burnett, Drew Storen and Matt Capps shutting out The Tomahawk Choppers through four strong innings to finish this game off. But tonight's play started and really ended with Miguel Batista. Every single one of Miguel's 83 pitches thrown from the stretch this evening. Not once did Batista throw from the full windup. He pitched a Strasburg like dominating game without the 100 MPH heater, when not one single person among the announced crowd of 40,043 really expected it. The PlayBill said Strasburg. The Scorecard though read Batista. In Baseball, like on Broadway, never expect the obvious, always believe in the unpredictable. And more times than not, something wonderful will happen--accidentally. That's baseball in a nutshell, acted out on the big stage in The Nation's Capital this evening. Certainly, those fans booing the late scratch of Stephen Strasburg may well have been upset over not seeing Washington's Phenom pitch. They might also have been worried the weren't going to get their money's worth? But even if Our Number 37 had toed the rubber tonight against The Atlanta Braves, the outcome could not have been much better. Batista, with help from his bullpen shutdown the potent offense of the N.L. East leaders completely, while Nyjer Morgan sparked the top of Our Manager Jim Riggleman's lineup and Ian Desmond kindled the bottom. In between, solid defense all around. When Adam Dunn gets into the defensive act with a run scoring save on a Desmond wild throw to first base--scooped up while still keeping his leaning big body's foot on the bag in the top of the 5th on a ground ball hit by Martin Prado--you know something special is in the works. If that toss was missed, Melky Cabrera would have scored from second base easily and this drama could have changed drastically. Instead, a command performance was underway. The understudy getting the job done on the mound while the regular cast members stood behind him providing their full support. The back up actor's role is to seamlessly fit himself into his spot without missing a beat when the star goes down. Miguel Batista did just that this evening at Nationals Park. He gave his Washington teammates exactly what many expect of Stephen Strasburg every single time Our Number 37 trots to the mound--shutout ball and the optimum chance at victory. Final Score from Nationals Park where when Stephen Strasburg did not make his expected start only the worst thoughts came to mind: Our Washington Nationals 3 and The Atlanta Braves Zero. Curly "W" number 43 was won by Our Number 43 and backed up by his supporting cast, but not before Mike Rizzo removed the star attraction from his appointed duty this evening as a precautionary move. Upon hearing that Stephen Strasburg was having trouble warming up, Our General Manager made the right decision, even if unpopular among the masses in attendance on South Capitol Street, by not taking any chances with Washington's expected star hurler for years to come. The Bang!! Zoom!! Of The Fireworks!! muted a little upon hearing the news that Stephen Strasburg's MRI showed inflammation in his right throwing shoulder. A medical result that now has Our Number 37 listed as day-to-day. But as on Broadway, the show must go on and Miguel Batista stepped into the starring role and acted as if he was born for the job. Although jeered upon hearing his name called out on the P.A. as tonight's starter, Batista eventually won over the hearts of those very same fans as he exited to the clubhouse for the final time this evening. The stand-in had filled-in and proved to be a worthy successor. Miguel Batista wasn't overpowering. He wasn't throwing nearly 100 MPH and he doesn't possess a 90 MPH changeup, but he pitched as well as he's thrown all season. With the headliner down, Batista pinch hit and nary a sole missed a beat--incredibly. Miguel's probably not going to win a Tony Award or a Cy Young either, but on this evening at Nationals Park, he did a wonderful Stephen Strasburg imitation. And the near sellout crowd? They loved it!! The earlier jeers now turned into cheers. On the very night Miguel Batista figured he would never start a Major League game, he instead garners his first personal victory of 2010. Yes, Burnett, Storen and Capps finished this game off, but Batista set the table. A high standard needed to overcome the unexpected loss of Stephen Strasburg before the very first official pitch was even thrown this evening. Matt Capps recorded his 25th save in 1-2-3 style in the bottom of the 9th. As for Strasburg, an MRI showed that he's developed shoulder inflammation, soreness that forced Mike Rizzo to shut him down this evening for precautionary measures. A wise decision that makes you wonder whether Stephen Strasburg might have thrown his final pitch of 2010? 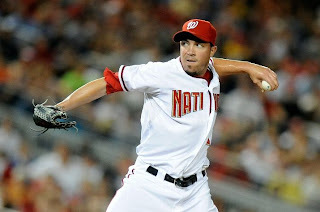 Considering all the pressure he's been under and how well he's handled it all this season--protecting Stephen Strasburg for tomorrow by giving up today, and the next two months of 2010 is a decision worth backing. The cautious route is OK by us. Atlanta's young stud pitcher, Tommy Hanson, pitched six solid innings. His defense let him down with two errors behind him and he left having allowed three runs, only one of which was earned. Hanson's personal record dropped to 8-7 for the season. In the bottom of the 1st inning, Nyjer Morgan manufactured a run all by himself. Leading off, he singled to center off Atlanta's Tommy Hanson, then stole second base with Cristian Guzman batting. While "Guz" was still in the batter's box, Morgan took off for third. Not expecting the attempt, Atlanta's Catcher, Brian McCann, tossed the baseball past Chipper Jones into left field. Nyjer scoring easily for Washington's first run of this game on the error. Washington's second and third runs also resulted from a Braves error. Pudge Rodriguez slapped a hard grounder to Chipper Jones at 3rd base in the bottom of the second. A possible double play ball with Roger Bernadina running to second from first. But Jones rushed his throw after making the swirling backhanded stab and tossed the ball into rightfield. Bernadina rushing to third and Pudge scampering to 2nd, where they both scored easily on Ian Desmond's laced liner to center moments later. The final runs scored all evening by either team. Not much offense on display tonight just good pitching. Six hits for Washington, the only extra base hit a double by Ryan Zimmerman moments after Morgan scored D.C.'s first run in the bottom of the 1st. 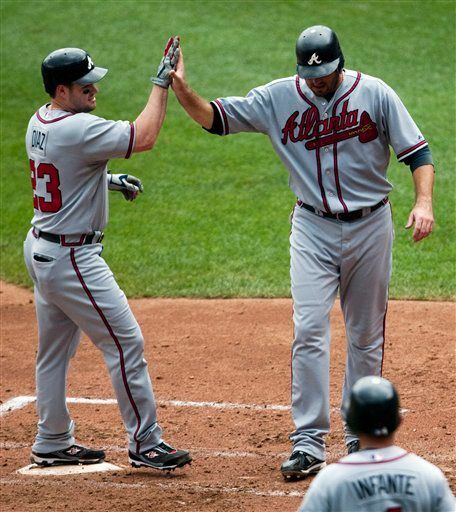 Only five hits by Atlanta including a double by Eric Hinske. In the top of the 6th with Chipper Jones on 1st base via a single off Sean Burnett, McCann lined what looked like was going to be a sure single to center. But with Washington's defense overshifting to the right for the pull hitter that Atlanta's left handed hitting catcher can be--the baseball went right to Ian Desmond who fielded the ball behind and on the 2nd base side of the infield. With Cristian Guzman too far away from the bag, Desmond showed great athletic ability by rushing to 2nd base to just beat Jones for out number one--then fired a rocket to Adam Dunn manning first to beat McCann for a double play and The Defensive Play Of This Game. It was a fine play nearly outdone by Martin Prado in the bottom of the 6th. Josh Willingham absolutely hammered a sharply hit ground ball to the right of Atlanta's 2nd Baseman. The 2010 N.L. All-Star ranged over to backhand scoop the ball. But as he brought his glove up to take the baseball out his mitt, the ball popped out and into the air--straight up. Still moving away from 1st base and more towards centerfield--Martin Prado leaped into the air to retrieve the lost baseball and grabbed it barehand and heaved it to first base in one motion--just missing Willingham. Martin Prado had shown quickness, skill and athletic ability. The only thing he didn't get for his effort--was the out. But that was one nice defensive play too. Interestingly, on the night Stephen Strasburg was pulled from his start, Our Washington Nationals announced on the HDTV Scoreboard that Strasburg's June 8th Debut Game Video from MASN will be handed out to the first 15,000 fans on August 12 when The Florida Marlins visit Nationals Park. Before tonight's game, NASA's Space Shuttle Crew from STS-132 was honored, as was Matt Capps for his 2010 All-Star Game appearance and personal win received while pitching for the National League squad in Anaheim, California. Ryan Zimmerman also was awarded this evening the Major League Baseball Players Alumni Association's Heart & Hustle Award for Our Washington Nationals. Former Washington Senator, Jim Hannan, presented Ryan with the award given to one player on each of the 30 Big League Teams. The overall individual winner will be announced later this year at ceremonies in New York City. And finally, the outfield grass at Nationals Park was in terrible shape tonight. The stage and seats placed in the outfield last weekend for The Dave Matthews Band Concert did not go well with temperatures rising to 100 degrees. Burn spots were clearly seen all over the field. Not sure if it affected play, but the field looked awful. "Don't Worry. I Got This!" The Z-Man Has Done It Again! !